The continuing rise in agricultural productivity and impressive tourism performance that Bicol region has been demonstrating for three years stayed at the forefront in propelling the growth of the region’s economy this year. Days ahead of the closing of the year, the National Economic Development Authority (NEDA) regional office on Tuesday said the Aquino government has not been mistaken in focusing on these sectors with the most potential in the 2011-2016 Philippine Development Plan (PDP) insofar as the region is concerned. These sectors have been identified as among the key areas that are job-generating where Bicol enjoys comparative advantage and with high growth potential. The government has focused its interventions on these, resulting in a sustained increase in attractiveness towards making the region one of the centers of economic activity outside the National Capital Region (NCR), the NEDA said. Such focus has been based on the study on the National Spatial Strategy that suggests a strategy of “concentration,” among others, as it is associated with increased growth and poverty reduction, it added. More focus from local government leaders, however, is still needed by the farming community that comprises 40 percent of the region’s economic sectors. The LGUs should wholeheartedly support national government efforts toward improving farmers’ income and one of these is the recently launched campaign of the Department of Agriculture (DA) that opened an opportunity for local rice-based farmers to earn at least a million pesos from their one-hectare farm per year. Called the Rural Transformation Movement (RTM), the campaign anchored on the “Gusto Naming Milyonaryo Kayo (We Want You to be Millionaires)” advocacy of the Philippine Rice Research Institute (PhilRice) involves a holistic, inclusive, and sustainable growth in rice-based communities. The campaign is in support of Pres. Benigno Aquino III’s social contract made to the Filipinos that highlights poverty alleviation, food security, higher family income, climate resilience and employment generation, Gonzalez said. In this campaign, PhilRice is determined in making farmers earn Php1 million-worth of harvest per hectare per year through one of its recently developed projects—the Integrated Rice-Based Agri-Bio Systems (IRBAS) that aims to increase production of rice and other crops with high market value. In the recent palay harvest in Ligao City, Albay for example, Gonzalez said, some rice fields planted to hybrid varieties have been successful in producing up to 200 cavans of 50 kilos per hectare which at present day prices generate as much as Php180,000 per cropping period. “The recent harvest was good, but not good enough as there’s still much room for improvement which when taken advantage of may lead to nearly doubling that earning towards the Php1 million mark in a year-round period of three-cropping cycle,” he said. According to the DA regional office based in Pili, Camarines Sur, government interventions supported by productive manpower have been showing impressive results for Bicol’s agricultural economy. In rice alone, the region has been self-sufficient since last year owing to good harvest brought about by the implementation of the Aquino administration's Agrikulturang Pilipino (Agri-Pinoy) Rice Program which has proven its worth as a key player in the government’s Food Staples Sufficiency Program (FSSP). With the vision of a food-secure society where farmers enjoy decent standards of living, the FSSP aims to achieve self-sufficiency in food staples for the country by 2016 and beyond. Bicol this year has been 118-percent rice self-sufficient while other local crop sectors like corn, abaca, coconut and pili also contributed heavily this year to the region’s agricultural productivity, DA records show. Bicol’s astounding economic performance this year is also fueled by healthy tourism that contributed a significant volume of employment and income, especially in the services sector such as transportation, communication, accommodations and food, among others. The Department of Tourism (DOT) regional office said the total number of tourist arrivals during the year is estimated to reach around four million to surpass last year’s 3.2 million record. While gross income receipts from these tourist arrivals in 2013 were placed at some Php1.9 billion, this year could come up with over Php2 billion, according to DOT Regional Director Maria Ong-Ravanilla. Such increases this year could at the same time result in job generation that is higher in volume compared to last year’s 3.9 million, she said. “We do not have yet the exact figures as reports from the region’s six provinces and seven cities are still being collated. The year-round trend, however, leads to those optimistic estimates,” Ravanilla explained. 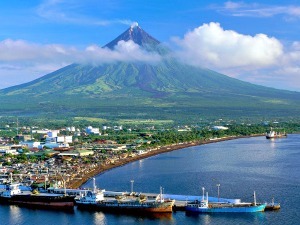 Legazpi City alone, she said, realized notable upward trend in arrivals—from 438,100 in 2012 to 579,470 last year, then to as much as 700,000 this year.